The other day, town arts curator Kathie Motes Bennewitz moved a Westport Public Art Collection painting from the Parks & Recreation office to Town Hall. 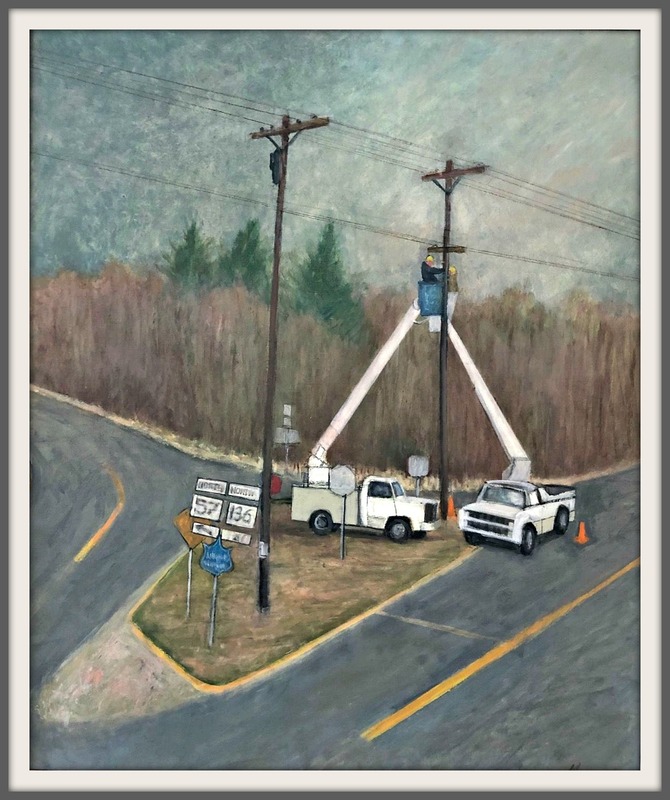 “Up by Daybreak Nursery” — done by noted Westport artist Howard Munce in 1989 — showed the weird Weston Road/Easton Road/Main Street intersection, near Merritt Parkway Exit 42. In 1989 I came upon this scene and quickly went home for my camera. The locale is at the convergence of Rt. 136 and Rt. 57 — just opposite the Daybreak Nursery. When former 1st Selectman Bill Seiden saw it he said “Worst traffic situation in town.” Many agree. Since this painting was done, the nursery has built and planted a mound on the small island that separate the two roads. Also, the Merritt Parkway entrance has been redesigned, causing greater complication at the corner. On the left, Jim Izzo — owner of Crossroads Ace Hardware — described nearby Main Street and Canal Road. “There is an accident every 2 weeks or so, some kind of fender-bender or something,” he said. 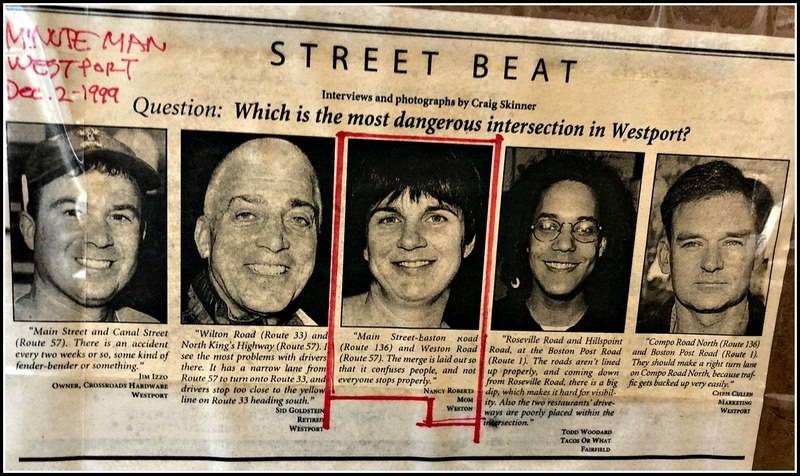 Sid Goldstein nominated Wilton Road and Kings Highway North, because of its narrow turning lane onto Wilton (since improved), and “drivers stop too close to the yellow line on Route 33 heading south” (still an issue). Those comments were made 20 years ago. Many are still relevant today. And probably will be in 2039, too. Hot on the heels of 157 Easton Road — the former home of concert violinist Leopold Godowsky Jr. and his wife Frankie Gershwin (George and Ira’s younger sister) — another Westport property with a wonderful arts pedigree is on the market. 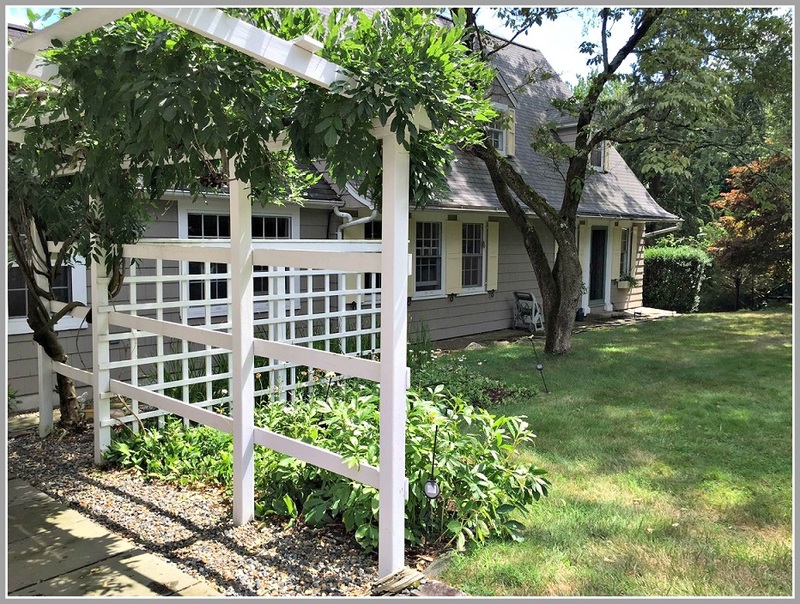 60 Roseville Road is listed on a state database of homes owned by famed children’s book authors and illustrators. From 1946 until his death 30 years later, Hardie Gramatky lived — and worked — there. His name still resonates. In 2006, Andrew Wyeth called him one of America’s 20 greatest watercolorists. Decades after he wrote and illustrated Little Toot, it remains a beloved classic. 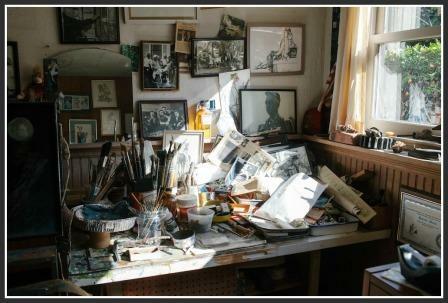 The other day, Linda Gramatky Smith — the artist’s daughter — and her husband Ken sat in the light-filled home. They’ve lived there since 1993. Now they’re moving to New Jersey, to be closer to their daughter. They hope they can sell it to someone who cherishes its creative bones. The house has had only one other owner. Joe Chapin — a famed New York art director — built it as a weekend place. When he died, his wife Henrietta moved to Imperial Avenue (where she lived with Rose O’Neill, creator of the Kewpies comic characters). The Roseville Road house was rented out. In the mid-1940s, tenants wanted to buy but could not afford the asking price. So they refused to let potential purchasers inside. Gramatky peered into the windows. He loved it — and bought it for $22,000. 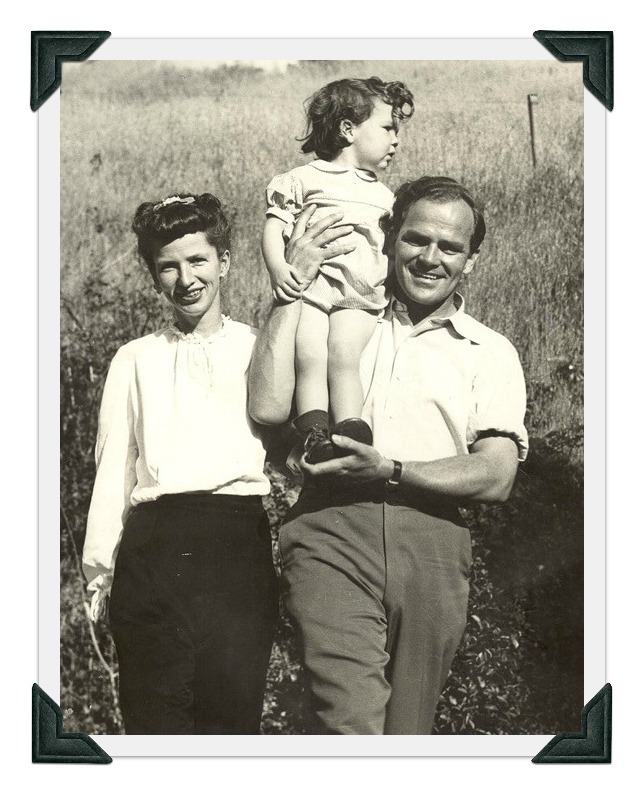 Hardie Gramatky, Dorothea Cooke and their daughter Linda, during their early days in Westport. Moving day was set for December 26, 1946. A huge snowstorm roared in a few days earlier. The tenants — still enraged at not being able to buy — turned off the heat, and opened the windows. Realtor Muriel Baldwin drove by, and saw what was happening. 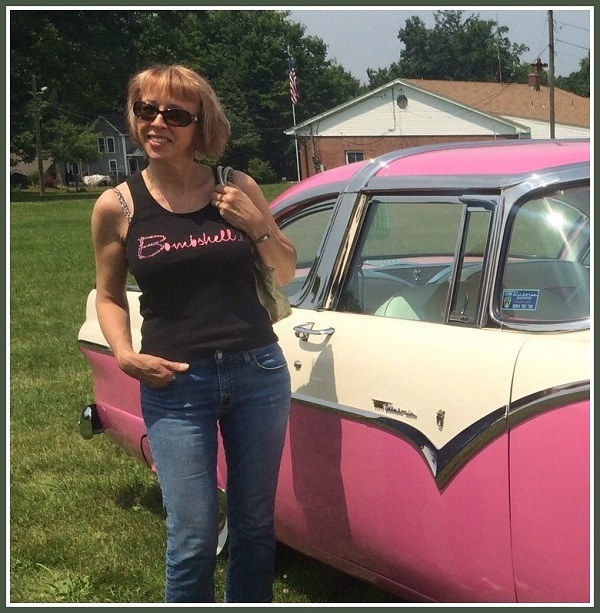 “She saved the house,” Linda says gratefully 70 years later. Gramatky quickly became part of Westport’s lively arts community. With Stevan Dohanos, he started a watercolor group. 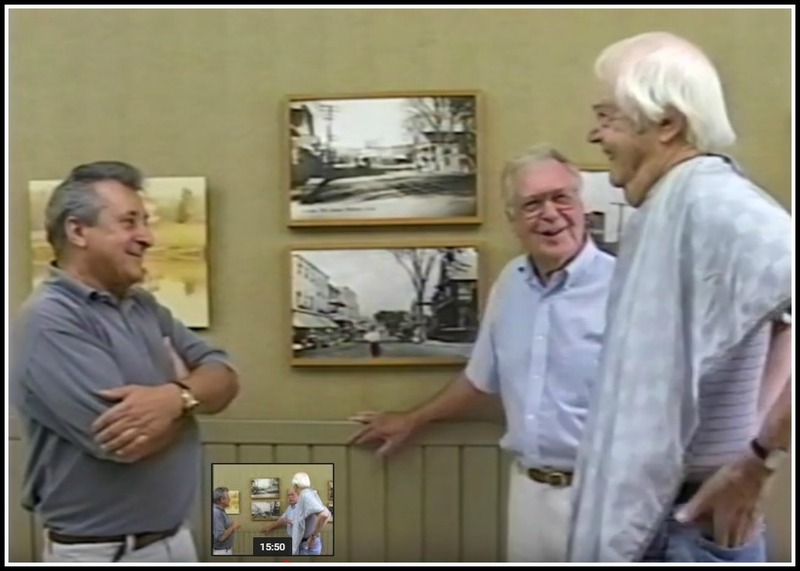 Howard Munce, Ward Brackett and others met monthly to chat, critique each other’s work, and socialize. Gramatky created a “Little Toot” poster for the Westport Red Cross. He drew caricatures at the Yankee Doodle Fair, was a frequent elementary school classroom guest, and played in the popular fundraising “artists vs. writers” basketball games. Gramatky’s wife, Dorothea Cooke, was a noted artist herself. She drew covers for magazines like Jack and Jill, and lived in the home until her death in 2001. “They adopted the community. And the community adopted them,” Linda says. His home inspired his work. Gramatky could see Long Island Sound from an upstairs window, and painted that scene. Another work shows a boy and his beagle walking down Roseville Road — then just a country lane. He painted the 1867 house across the street — owned for years by the Fonetlieu family — from many angles. Linda hung some of those works in her living room, next to windows with a view of that home. When Gramatky was dying of cancer, he spent much of his time in the warm sun porch. 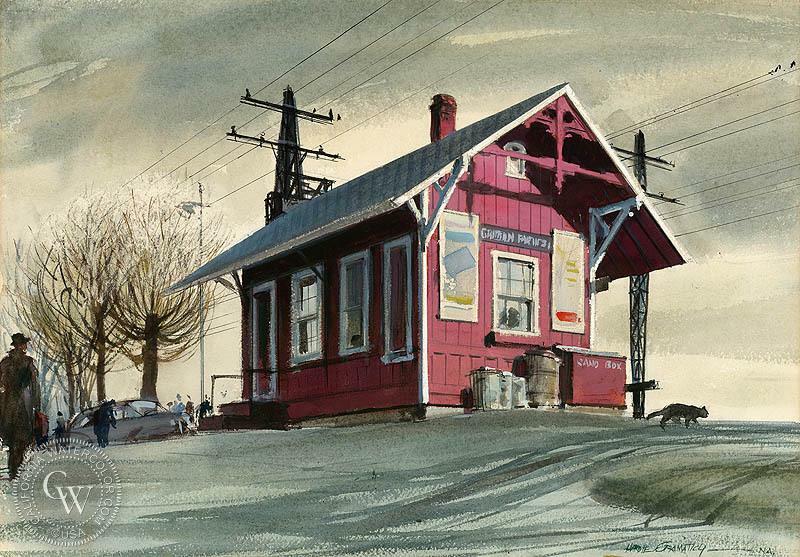 “Green’s Farms Station,” by Hardie Gramatky. Linda looks around the house that she and Ken are selling. It has a long, rich history, and holds memories. 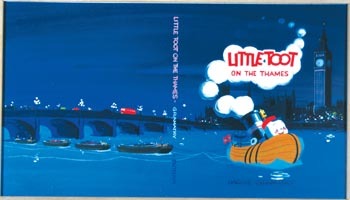 Hardie Gramatky donated this “Little Toot” book cover to the Westport Schools Permanent Art Collection. So Westporters may be forgiven for not realizing that for several reasons, this year’s event is special. For one, it’s dedicated to Howard Munce and his wife Gerry, a longtime WWC member and community volunteer. 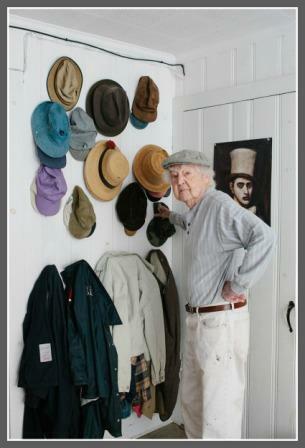 When Howard died recently at 100, his place as one of Westport’s foremost artists was secure. Howard’s roots here date back to the Great Depression. At that time, Westport supposedly had the largest per capita population of unemployed professional artists in the country. Many were married to Woman’s Club members. To help, the WWC held art shows in Bedford House, the 2nd floor of the downtown YMCA. Howard was no starving artist. He went on to great fame. But he showed his appreciation for the Woman’s Club by participating in art shows through the 1980s, long after the organization moved to its 44 Imperial Avenue home. In 2007 — when the WWC celebrated its centennial — Howard designed the logo. Gerry and Howard Munce. 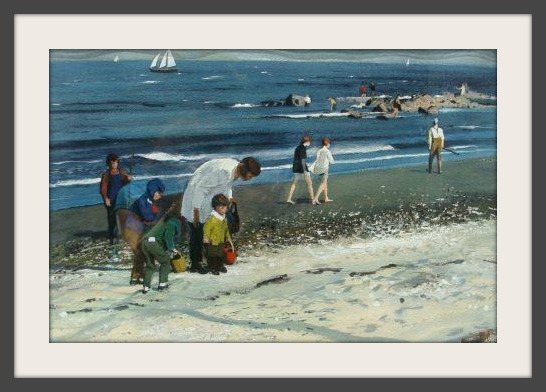 This weekend’s Westport Woman’s Club art show is dedicated to them. 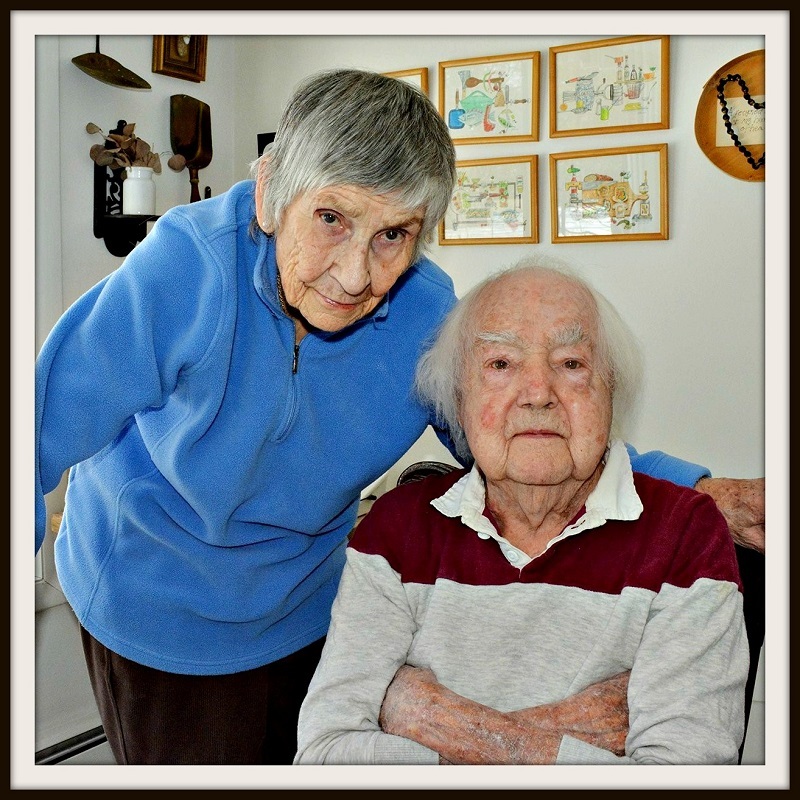 Howard and Gerry were friends with another civic-minded local family, the Burroughses. Bernie (an artist) and his wife Esta (of Remarkable Book Shop fame) raised 2 artist sons, Miggs and Trace. 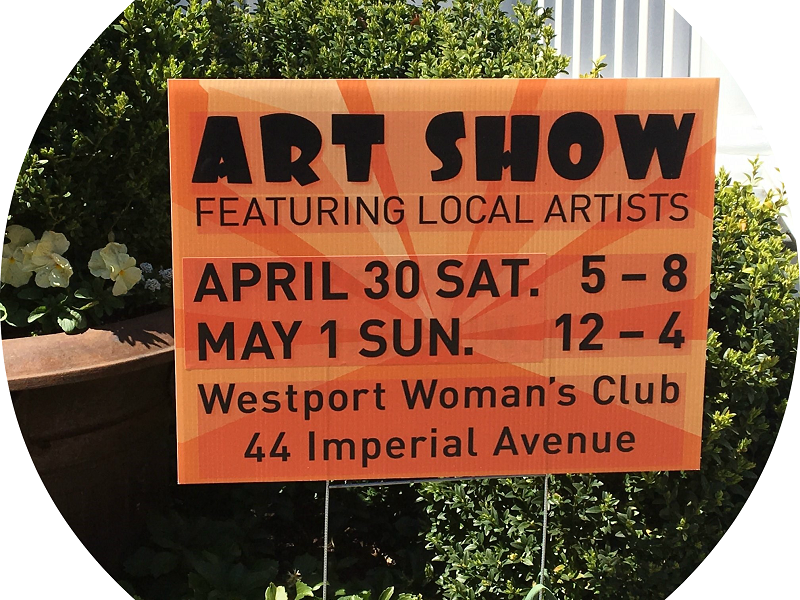 The Westport Woman’s Club art show venue has changed, since the Depression. Howard Munce — for the first time since then — won’t be there this year. But the show itself hasn’t changed much. It’s still fun, and still an important fundraiser. And Howard and Gerry will be there for sure, in Westport arts colony spirit. 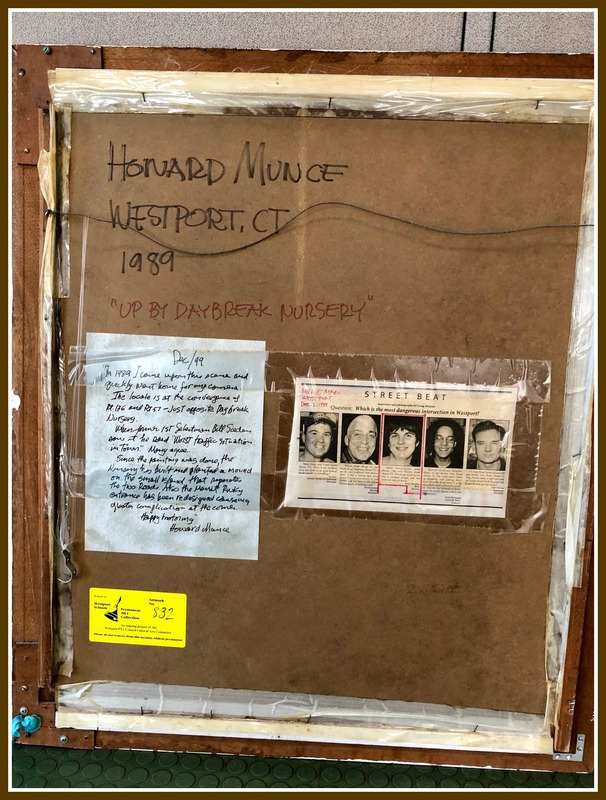 Howard Munce — a much-admired artist, indefatigable Westport volunteer, World War II veteran, good friend and beloved human being — died yesterday. He turned 100 in November, and enjoyed a townwide celebration in his honor at the Westport Historical Society. Mark your calendars, Westport. 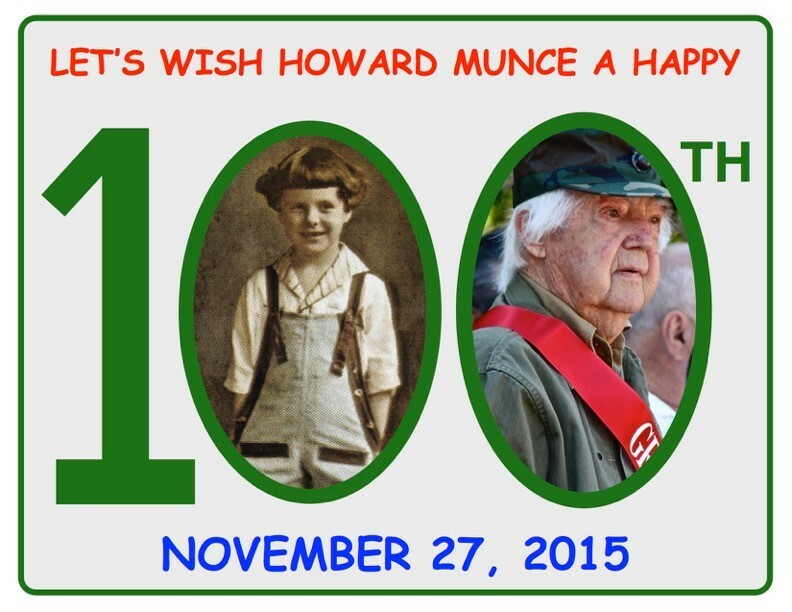 On Friday, Howard Munce turns 100. In a town long known for its great artists, illustrators and painters, he’s a towering figure. Howard’s resume — advertising director, graphic designer, sculptor, cartoonist, book author, teacher — ranks him with the most prominent creative folks in our history. He served his country in World War II, seeing action as a Marine platoon sergeant at Guadalcanal. He’s served his town too. Howard has been an honorary board member of the Westport Arts Center. For over 25 years, he volunteered as graphics director for the Westport Library. Howard Munce epitomizes 2 of our community’s proudest traits: our arts heritage, and our spirit of giving back. He’s been a proud Westporter since 1935. He came here to live with family friends, while commuting to Pratt Institute in Brooklyn. One of his first jobs was modeling for famed artist Harold von Schmidt. Westport has been an important part of Howard’s life ever since. And he’s been an even more important part of ours. Munce’s resume is beyond impressive. Trained at Pratt Institute, he was a Young & Rubicam art director beginning in the late 1940s — after World War II, when he saw action as a Marine platoon sergeant at Guadalcanal. 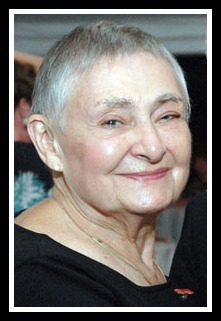 Munce is professor emeritus at Paier College of Art; honorary president of the Society of Illustrators in New York City, and an honorary board member of the Westport Arts Center. For over 25 years, he volunteered as graphics director for the Westport Library, and — with Fisher — co-curated the black-and-white drawings by Westport artists in its McManus Room. But those are facts. Far more important is Munce’s humanity. Whenever he is asked to help — donating dozens of paintings and illustrations to the Permanent Art Collection; curating exhibits for the WHS; mentoring young artists — he always says “of course.” With a sparkle in his eye, a smile on his face, and a handshake as firm as a 20-year-old’s. Until a couple of years ago, he clambered up ladders to make sure every exhibit he oversaw was properly hung. 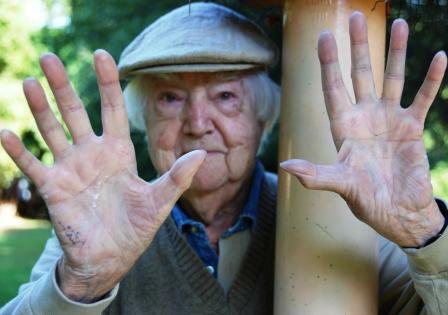 At 99, Howard Munce no longer climbs ladders. Then again, he doesn’t have to. He long ago reached the top. For an interesting story on Howard Munce’s World War II experiences in New Zealand, click here. For a 2013 tribute to Howard from the magazine Five O’Clock, click here. What do you give a man who has seen and done everything? How about a townwide ton of birthday wishes? Just click “Comments” below. Howard does not get on the computer much, but his daughter and home health care aide look forward to reading them to him. Howard, happy hundred! Thank you for all you have done, for all of us. You have made Westport a far better place, and my life is far richer for knowing you. May your momentous day be as bright as your ever-present smile! Westport’s famous artists — and Famous Artists School — have come and gone. The “Mad Men” era — the real 1950s and ’60s ad agency scene, and the TV show celebrating it — are both just memories. In a town long known for its great artists, illustrators and painters, he’s a towering figure. Advertising director, graphic designer, sculptor, cartoonist, book author, teacher — and, above all, longtime and beloved civic volunteer — Munce turns 100 on November 27. The Westport Historical Society — one of the many organizations he’s served so well for so long — has the perfect gift: his own show. “Howard Munce at 100: A Centennial Celebration” opened June 29. A gala reception is set for this Sunday (July 12, 4-6 p.m.). It’s hard to capture a century of life — and 8 decades of professional work and life in Westport — in the walls of one building. But the WHS tries. The exhibit is curated by Leonard Everett Fisher, Munce’s longtime friend. In his 90s himself, he’s the perfect choice to organize the show. There are 2 parts. The Sheffer Gallery showcases Munce’s paintings, drawings, illustrations and sculptures. The Mollie Donovan Gallery chronicles his Westport connections as a young artist (he first came here in 1935); his military service, when he sent illustrated letters to his Westport artist friend Stevan Dohanos; Munce’s Pulitzer Prize nomination for his essay on the folly of war; his role in a legendary ad campaign for Rheingold beer, and his community involvement. The exhibit includes documentary films, interviews, photographs by Laurence Untermeyer, and a lenticular photo of Munce by Miggs Burroughs. It’s dedicated to Munce’s wife Gerry. She died in November, but her memory is vivid to all who knew and loved her. 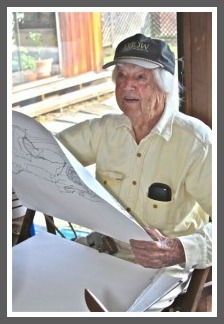 In his 97 years, Howard Munce — talented illustrator/writer/painter/sculptor/ cartoonist/teacher, longtime Westport volunteer, awesomely good guy — has been profiled by nearly every publication that covers those things. If you don’t know — and I sure didn’t — that’s the online magazine put out by Harry’s, a trendy quality-craftsman men’s razor company. So, um, no offense, but what would they want with a 97-year-old, white-haired guy — no matter how prolific and beloved? Turns out Howard’s granddaughter Rebecca Brewster works for Harry’s. One day in their Union Square office, she was talking about Howard and his ad agency days. Perhaps sensing a connection to Mad Men, they wanted to meet him. Soon, a writer and photographer traveled to Westport. The result is a breezy, loving look at a local icon, covering his service as a Marine in World War II, his time in New York as a neighbor of Norman Rockwell, and his work with agencies like Young & Rubicam. How nice to find on this webzine — filled with articles profiling a hipster San Francisco bread maker, and advice on properly winterizing your beard — a loving portrait of this graceful man, old enough to be some readers’ great-grandfather. When Mollie Donovan died a year ago, Westport mourned. A vibrant, creative and very bright woman was gone. 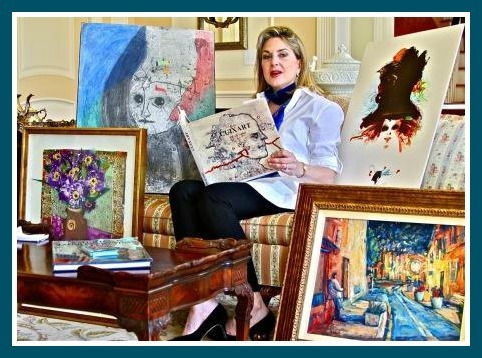 On a more practical — and selfish — level, we worried that her many areas of expertise — arranging Westport Historical Society exhibits, for example, or hanging paintings for the Westport Schools Permanent Art Collection — would be lost forever too. Though Mollie was irreplaceable, she continues to give back to her favorite activities. The donations made in her name are one example. An event this Saturday (April 21, 7 p.m., Westport Playhouse Barn) is another. 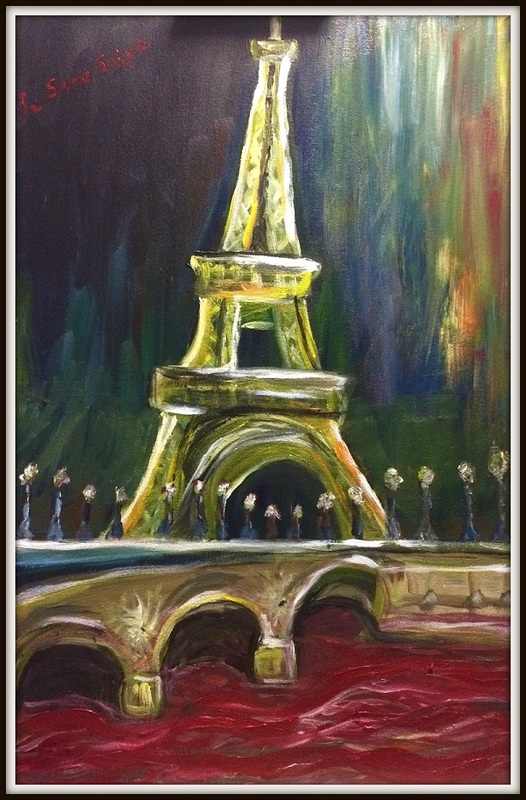 The “Mollie Gala Art Auction” features 100 high-quality pieces. They come from local and regional artists — and as far as Barcelona. Westporters Leonard Fisher, Hardie Gramatky and Howard Munce are represented; so is Modesto Cuixart, who in 1959 was selected over Picasso as best painter at the São Paolo Bienal. The auction is a fundraiser for the Westport Historical Society, one of Mollie’s many beloved organizations. There will be beautiful art, with silent and live bidding; music from a string quartet and pianist, and plenty of food and wine. It’s a typical Mollie Donovan event: classy, artistic, and all for a good cause. A year after she left us, she’s still helping her hometown out.